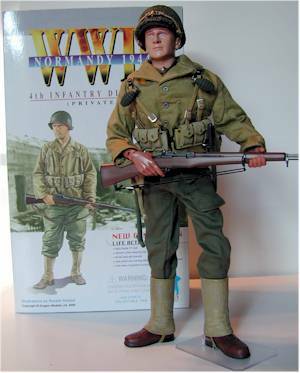 I was so impressed by Dave, the first American WWII figure produced by Dragon, that I looked around for the best deal I could find and then picked up Scott, the rifleman. Sean, a BAR gunner and the third American figured to be produced, was just released in August. I've kept a large number of links at the bottom for those looking to find these on-line. Right now few stores carry them, so on-line is really your best bet to find a variety. Some on-line stores will also sell individual items from the characters, but their stock is often limited so make sure you buy early if you see something you want. The official Dragon site is at www.dragon-models.com. I picked up Scott at www.kbkids.com, and used one of their coupons to get another $5 off. The body is still as great as the last three reviews. Unfortunately, my Scott seems to have slightly loose knees, though, and it detracts a bit from the quality of the figure overall. Not a bad sculpt, but not as much character as Dave. He actually looks very German to me, but that might just be me. The paint work is excellent again this time, not showing any of the odd wash effects that some of the earlier German figures had. Similar to the packaging for Dave, Scott has his large amount of extra equipment stored in a plastic sleeve attached to the front flap. Again, you can completely remove this figure and his accessories from the box without damage. I still wish they'd lose those two twistys they use - I think there must be some sort of 'two twisty' requirement since they don't seem to use them for the same accessory with two different figures - but overall this is some of the finest packaging on the market. This is how the 12" figure market will be going, and 21st Century needs to get on board. They made one additional improvement this time. Since the plastic sleeve on Dave's box covered the writing, this time they've moved the informational text to the back of the box. Another excellent job, and fantastic quality all the way around. 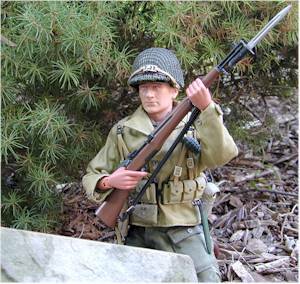 A very realistic uniform, with excellent stitching and materials. The harness/belt are particularly well done this time, and a tremendous improvement over the same accessory used by 21st Century or Hasbro. The only negative is the helmet this time. It seems big on his head, and not quite in scale. It also appears as though the inner helmet isn't removable this time - it may be, but I didn't want to damage the netting on the outer helmet by trying to pull it apart. Lots of great accessories, and they've gotten the right amount. 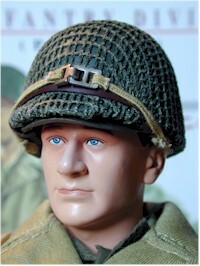 Often, 21st Century provide too many - at least on their WWII figures. I've noticed a decided lack of accessories on some of the new pilot figures...but back to Dragon. With some of the earlier Germans, I was left wanting a bit when it came to accessories, but now both Dave and Scott have given me just enough for my dollar value. While the shovel, bayonet case, canteen, grenades and clips are all very nice, the rifle and bayonet are the real stars here. 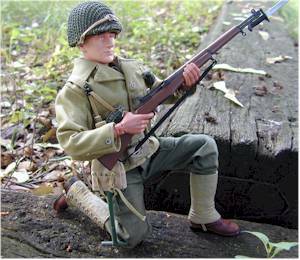 The rifle detail is excellent, with a even a sliding bolt, and the bayonet fits on the front of the rifle beautifully. Great construction and design on these accessories. As with Dave, you have to watch out for the small pegs on the canteen bag. They pull out easily, and I had to re-glue both of mine once I'd put the canteen in it's place. And oddly enough, they've included a small, plastic display stand with Scott. I haven't seen this with the other Dragon figures so far, and it's a very nice touch. Only problem is that it only goes on one foot, leaving the other foot slightly off the ground. Therefore it doesn't work quite as well as I'd hoped, but once again it's obvious that Dragon is thinking and trying their very best to please the customer. UPDATE - I'm told by my friends that I'm an idiot. These little stands have been coming with Dragon figures for a long time, if not right from the beginning. I've just not noticed them and been throwing them out! Whoops. Well, now you know not to make the same mistake as I. If you haven't yet picked up a Dragon, you really don't know what you're missing. I can no longer bring myself to spend $30 on a 21st Century figure, when I know I can get so much more for my money from Dragon.